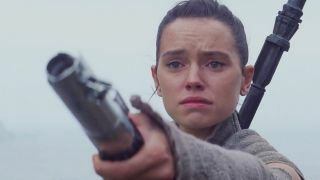 Star Wars: The Force Awakens’ ending – up until The Last Jedi came out, anyway – was the one thing that had everyone talking. The silence followed by that stern look from Luke, that setting. Everyone was abuzz about what it might mean. Except, as Mark Hamill reveals, it all could have been different – and would have taken Luke Skywalker in a massively different direction. During an interview with Chinese site M Time (H/T Digital Spy), Mark Hamill opened up about what could have been a different shot as we (and Rey) laid eyes on Luke. "When we were doing [The Force Awakens], Rian said, 'We might have boulders floating to show your Force emanating', so I was led to believe that I still had the Force and it was really strong in me." Now, that’s big. The Last Jedi was only too happy to hammer a home a Luke Skywalker who had cut himself off from the Force. It turns out we were so very close to having Luke still tied to the Force in a more meaningful way. Rian Johnson, though, chose not to forge forward with that ending, as Hamill explains, “When I read [The Last Jedi] before [The Force Awakens] came out, I said 'what? !’ and called JJ or Rian Johnson to say, 'Are you guys aware of this? Have you seen a cut? [Are] there floating boulders? '’ And they said, 'No, we caught that and we worked it all out'." It might have been a minor change having Luke say nothing instead of messing about with The Force, but it’s certainly not insignificant. In The Last Jedi we find a man who is broken and adrift; that all stems from the final moments of The Force Awakens. No words, no boulders, just a man on a mound. For more Star Wars insight, be sure to take a look at why Rian Johnson chose not to answer the mysteries of Snoke in the Last Jedi, or succumb to the dark side of temptation with the best Star Wars merchandise.